Description: CLEARANCE!!! Premium Plus Navy Blue Hand Towels in Bulk and made with Premium Plus quality cotton. Dobby border and end dobby hem. Perfect for any high-end use. Used by Salons, Gyms, Schools, Colleges, Sports activities. Available at a great low price! Description: White Soft Hand Towel available Wholesale of Standard Premium quality. DOUBLE STITCHED at hems. Blended towel 86% Cotton 14% Polyester. Towel loops made of 100% Cotton. Extra Strong! Available at a great wholesale price. Description: Wine color full terry bleach proof and bleach shield salon towels available in bulk. Made with 100% ring spun cotton. These salon towels last 3-4 times longer than standard salon towels. Can be washed with Hot water and even with Bleach and cold water. Description: ON CLEARANCE!!! 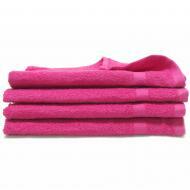 Premium Plus Hot Pink Hand Towels in Bulk with a Dobby border. Very nice towels with a lovely color available at very reasonable wholesale pricing! Description: ON CLEARANCE!!!! Hunter Green Hand Towels Premium Plus quality available in Bulk. 100% Ring Spun Cotton. Dobby Border, End dobby hem. A very nice quality high-end hand towels available at wholesale pricing! Description: Premium Plus Hunter Green Hand Towels in Bulk. A very nice quality high-end hand towels available at wholesale pricing! Looking for a heavier one then look at the 16x27 - 3lb hand towel in the same premium plus quality. Description: Premium Plus Navy Blue Hand Towels in Bulk. Dobby border and end dobby hem. Not too heavy and easy to dry. Made with Premium Plus quality ring spun cotton. Perfect for any high-end use. Available at a great low price! 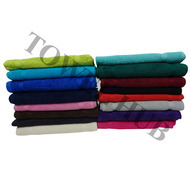 Description: Excellent quality wholesale AQUA color hand towel. Bulk price offer. Hand towel made with premium plus quality cotton yarn. Dobby border and End dobby hem. Double stitched reinforced hems for durability during repeated washings. A great buy! Description: Wholesale Burgundy Full terry Salon Towels bleach proof, color safe and stain resistant. Very popular with salons. Very long lasting and durable. A great buy here at TOWELHUB. Available at very low wholesale pricing! 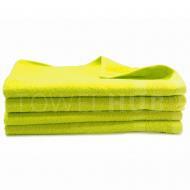 Description: Premium Plus Wholesale Lime Green Hand Towels, dobby border made with 100% Premium Plus Cotton. Perfect to use for Salons, Spas, Gyms and anywhere you need a good quality hand towel. Available at a low low wholesale price! Description: Wholesale Dark Brown Salon Towels in Standard Premium quality. Perfect hand towel for salon or any use. Please note this is not a bleach proof towel. If you are looking for bleach proof towel please look in our Bleach Shield towel category. Description: CLEARANCE!! !Wholesale Orange hand towel on offer in bulk. Made with Ring Spun 100% cotton yarn. Cam border, not very expensive. Great to use by Salons, Gyms, Schools, Sports teams, Golf & Country Clubs and anywhere you need an affordable small hand towel. Description: Wholesale Navy Bleach Shield¨ Salon towels that are bleach proof, color safe & stain resistant. Widely used by beauty salons & nail salons and anybody else who needs a high quality salon towel. Very long lasting and durable. At a great price offer here! Description: ON CLEARANCE!!!!!! Premium Plus Red Hand Towels in Bulk. A very nice and durable hand towel. Double Stitched. Excellent for high-end use. Available at amazing wholesale pricing! Description: Superb quality Beige / Ivory color Premium Plus color hand towel with a dobby border and end dobby hem. A very nice quality and highly durable hand towel double stitched at hems. Perfect to use for sports or any domestic use. Great price offer! Description: Wholesale Color Bulk Washcloths made with premium plus ring spun cotton. Available in many colors and available at low wholesale pricing! Remember these are not bleach proof washcloths. If need those checkout our Bleach Shield washcloths. Description: Wholesale Gold Hand Towel made with 100% Ring Spun Premium Plus Cotton. Excellent quality long lasting hand towel. Can be used anywhere you need a hand towel. Description: 100% cotton loops. 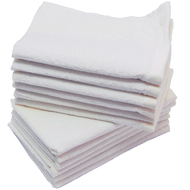 Blended Bulk White Washcloths, heavier weight can be used for any general purpose. Constructed to withstand commercial laundry for longer life. Perfect wash cloth for most applications. Description: ON CLEARANCE!!! Premium Plus Pink Hand Towels in Bulk with a Dobby border. Can be used by Gyms, Salons, Schools and Cancer awareness/fundraising events. Very nice towels with a lovely color available at very reasonable wholesale pricing! 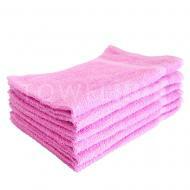 Description: Pink Hand Towel available in bulk made with 100% premium plus quality ring spun cotton. Not too heavy thus easy to wash and dry. Excellent hand towel for Salons, Gyms & Sporting activities. Available at a great price as always! 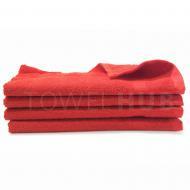 Description: Red Hand Towels Wholesale offer. Premium Plus quality 100% Ring Spun Cotton. Perfect to use at gyms, salon, sports, teams, colleges or wherever you need a small size hand towel. Description: Lime Green Hand Towels in Bulk. DOUBLE STITCHED at hems for extra strength. Premium Plus quality ring spun 100% cotton. Perfect for Salons, Spas, Gyms, Schools, Golf & Country Clubs and anywhere a nice hand towel is needed. Great deal!!! Description: Bleach Shield Hunter Green Bleach Proof Washcloths in Bulk. These washcloths are bleach proof, color safe & stain resistant. Available at an amazing wholesale price at TowelHub! Description: Bulk White Salon Towels Full Terry made of Premium Plus quality 100% Cotton Ring Spun Yarn. Ideal for domestic use. Has a tuck-in selvage therefore no chances of fraying. Full Terry towel ideal for screen printing & embroidery. Super soft available bulk! Description: Wholesale Burgundy Hand Towel made of 100% Ring Spun Cotton. DOUBLE STITCHED at hems for extra strength & long life. Perfect hand towel for salon or any use. If you are looking for a higher quality please view our Premium Plus hand towels. Description: Premium Plus White Hand Towel in bulk with dobby border and end dobby hem. Made of fine quality premium plus ring spun cotton. Used by Salons, Gyms, Schools, Colleges, Teams, Clinics and anywhere need a nice quality light hand towel. Description: Wholesale White Hand Towel Standard Premium with DOUBLE STITCHED hems (extra strong!) lasts for ever. Available @ Wholesale! Description: Wholesale Burgundy Hand Towel made with Premium Plus quality fine ring spun cotton. Dobby border and end dobby hem. Perfect for any high-end use. Available at a great low price! Description: Premium Plus Burgundy Hand Towels in Bulk. Dobby border and end dobby hem. Ideal for Salons, Spas, Sports, Teams, Clinics or any high-end use. Available at a great low price! Description: Color Hand Towels 15x25 size Standard Premium for Nail Salons. DOUBLE STITCHED at hems. Easy to dry. Many colors available. Wholesale prices! Looking for higher quality please check our Premium Plus quality towels. Description: Color Salon Towels available in Bulk 16x27 size. DOUBLE STITCHED at hems for long laundry life. If you are looking for Bleach proof and color safe towels please look at our Bleach Shield salon towels which are bleach resistant. 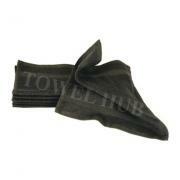 Description: Premium Plus Black Hand Towels in bulk. 100% Ring Spun Cotton. Dobby border and end dobby hem. Perfect for any high-end use. Available at a great low price! Description: Dark Brown Hand Towels in Bulk and made with Premium Plus quality cotton. Dobby border and end dobby hem. Perfect for any high-end use. Used by Salons, Gyms, Schools, Colleges, Sports activities. Available at a great low price! Description: Bleach Shield¨ Black Washcloths in bulk. Bleach proof, Color safe & Stain resistant. Available at a great price! Description: Bleach Shield¨ Burgundy Washcloths in bulk. Bleach Proof, Color safe & Stain resistant. Available at a great price! Description: Bleach Shield¨ Charcoal Washcloths in Bulk. These are Bleach Proof, Color safe & Stain resistant. Available at a great price! Please note this is a Washcloth size towel, if you are looking for a bigger salon towel choose from sizes 16x26 or 16x28. Description: Bleach Shield Navy Blue Washcloths in Bulk. These washcloths are of a Premium Plus quality and are Bleach proof, color safe & stain resistant. Available at a great wholesale price! Description: Bleach Shield¨ Dark Brown Washcloths in bulk. Bleach Proof, Color safe & Stain resistant. Available at a great price! Description: Wholesale White Fingertip Golf Towels hemmed 11x18 size. One side terry and the other side velour. Add a brass grommet & hook to the towel if you like. Perfect to embroider or screen print on. Available at great low wholesale pricing! Description: White Hand Towels in Bulk made with 100% ring spun cotton standard premium quality hand towel. DOUBLE STITCHED hems, extra strong. 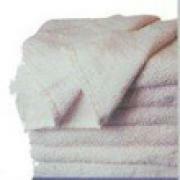 Wholesale prices offered at Towel Hub. Description: Premium Plus White Washcloths in Bulk. Ideal to use as face towel. Very soft and luxurious. Made of 100% Premium Plus quality cotton. Available at a great low wholesale price offer! Description: Bleach Shield¨ Purple Washcloths in bulk. Bleach Proof, Color safe & Stain resistant. Available at a great price! Description: Economy White Washcloths for general purpose cleaning and wiping. Priced very low and ideal to be used for wiping purposes. Absorbent and just perfect for cleaning purposes. Compress packed please wash to fluff. Description: White soft Ring spun Hand Towels in Bulk. These are very nice towels, DOUBLE STITCHED at hems. Extra strong, can go through repeated laundry washes. Towel loops made of 100% Cotton. Available at an unbelievable wholesale price only at TOWEL HUB.